Home >> Only Visible Part of the Regime Fell! Only Visible Part of the Regime Fell! Some people insisted that the corruption will not endure, suppression will not hinder those who call for democracy and Anas Al-Feki’s(1) media outlets will not hide crimes of National Democratic Party’s barons. A low voice in a demonstration included dozens of protesters had much influence than Maspero’s channels and satellite stations. The photo of martyr “Khaled Saeed”(2) was clearer than Osama Sarya’s (3) photoshopped photos and covers of Abdullah Kamal’s Roza Al-Yusseif (4). Responding to the calls for taking to streets in 25 January had a strong impact than the warnings issued by “Egypt is not Tunisia” experts. We didn’t imagine the overthrow of the autocrat is imminent, while the revolution is eagerly waiting. It was no more than a fragile regime; aghast like a mouse and coward like a rabbit. It didn’t remain firm more than 18 days, and stepped down! And it had to step down. We thought that it is a regime has faithfuls, not brokers who hide and escape like mouses that run away from a sunken ship. We imagined that this regime is like solid wall, although the cracks it has vertically and horizontally, holes carved in it, and mold stuffed the noses. This wall has rapidly fallen, prior to preparing materials and tools to build real strong wall on which all Egyptians can lean. The visible part of the wall has fallen, without its foundation. We were at the square, while “they” were planning and waiting to take the side of the winning party. “They” participated very late and left early after they were able to implant themselves among revolutionists. “They” were hesitant. They opened the way to the thugs of “Battle of the Camel”,and tried the poor and youth militarily. Thereafter, they greeted the martyrs, but without defending them. “They” were fabricating cases against the youth and those who call for democracy under Mubarak’s rule, and we believed that they would bring him to trial and govern justly. We broke fear, surprised the world and restored our feeling of belongingness to this nation. However, we didn’t take heed of some aides who left the square to negotiate with Mubarak-installed minister! We left Tahrir Square on February 11 before the departure of Tantawi with his president. He was the only minister that continued in his position!! Why he didn’t leave with Mubarak? Why we believed them when they were suppressing revolutionists before February ends, pulling them across the streets, performing virginity test on Egyptian girls? We didn’t listen to the youth’s warnings of Muslim Brotherhood and their overt and secret negotiation with Mubarak’s figures, to replace them. We only made some protests against the Attorney General, but we didn’t insist on reforming the judiciary and appointing an Attorney General that try Mubarak and restore funds of Egyptians, which were looted by both of Mubarak and National Democratic Party’s barons. We lost much blood for each mistake that was the result of continuation of their rule, Mubarak’s heir, and we believed the lie of third party, which snuffs lives out. We lost much blood due to their collusion, they participated late, left early, and avoided all the revolution’s demands in order to win the parliament, Presidency and Shura Council. We lost much blood because of their late justice, as they waited until Mubarak had arranged his situation and transmitted the smuggled money. They released those who killed the youth to fabricate the evidence of their innocence. We, however, paid the price, whether to learn from these errors, or the freedom that we deserve. The revolution hasn’t finished yet, and it will end by achieving our demands. Egyptians’ revolution, which started in January 2011, broke the fear, crossed red lines and revealed the truth of Mubarak’s heir and opportunism of Muslim Brotherhood. To ask more, is our legitimate right; we have paid the price. To make a mistake or do well are better than lying in wait or withdrawing. To call for a democratic civil rule, neither military nor religious, is our responsibility to restore the spirit of January and overcome mistakes of February. (1) Anas Al-Feki is Mubarak-era Information Minister. (2) Khaled Saeed: young Egyptian man who died under disputed circumstances in Alexandria on 6 June 2010. 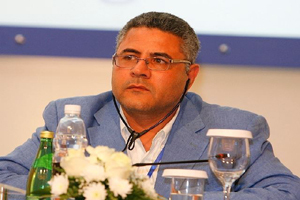 (3) Osama Sarya: editor-in-chief of Al-Ahram newspaper. (4) Roza Al-Yusseif: an Egyptian weekly magazine founded in1925. *This article is written by Gamal Eid, a prominent human rights defender, and was published in Al-Masry Al-Youm, on 24 January 2014.